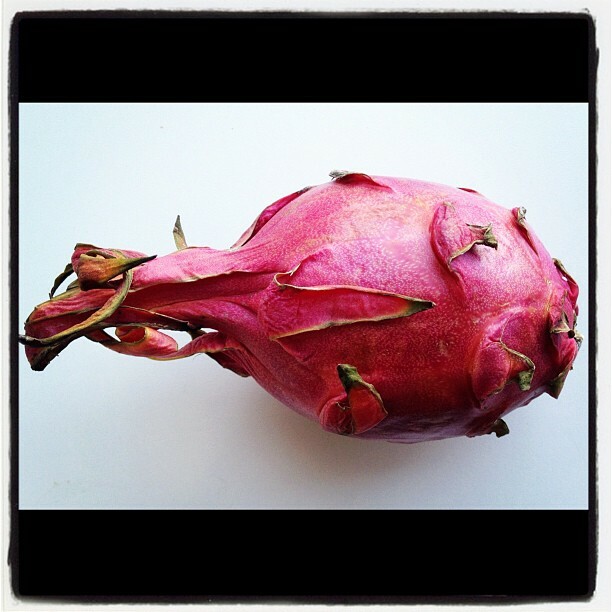 Meet Dragon Fruit (also called Pitaya). This beautiful exotic mistress of the fruit section. She’ll make your bananas jealous even though she’s just a once a year fling. It’s been a long time since I tried a new fruit and this one looked so good that I had to give in to its $9.99 price tag. Wow is right. This particular dragon fruit was about the size of a small papaya, split in half, both Jeremy and I received full bowls, which helped ease my anxiety over the price, just a little bit. I’ve seen others take this mistress out, I noticed from their photos, that she is indeed exotic, having black and white speckled ‘under garments’. Does this remind anyone else of oreo cookies or oreo ice cream? 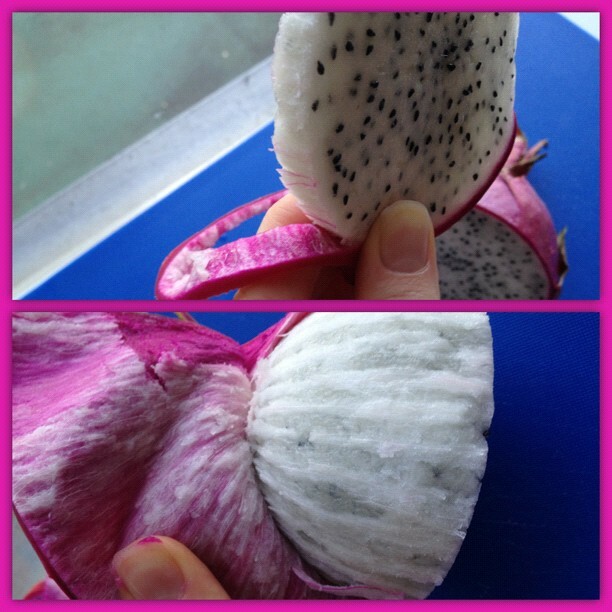 I took the above photo right before eating and this is what a ripe dragon fruit should look like. The leaves on the sides will start to get crinkly and brown and may even fall off. The fruit should yield, when squeezed, like a ripe mango or avocado. We bought ours at the store last Sunday and waited until Thursday to dig in. You could cut this in half, length-wise or cross-wise, or even in slices. The black seeds are edible and should be shiny like a kiwi fruit if it is truly ripe and fuzzy/brown if it’s not. 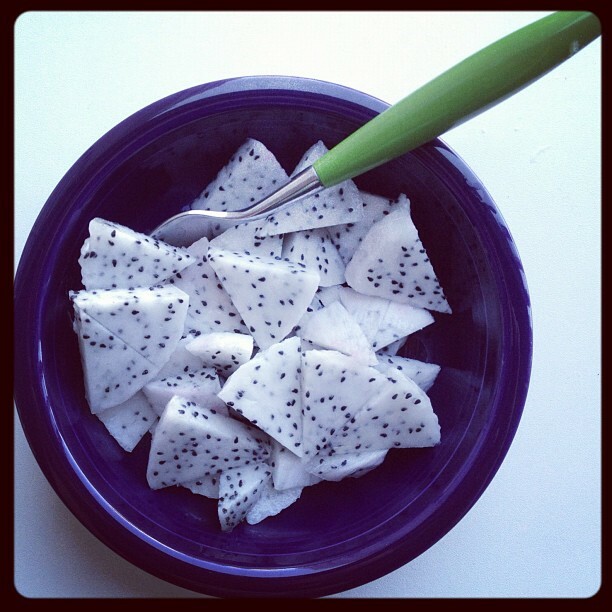 The white fruit reminded me of a white kiwi, but the seeds may have led me there. 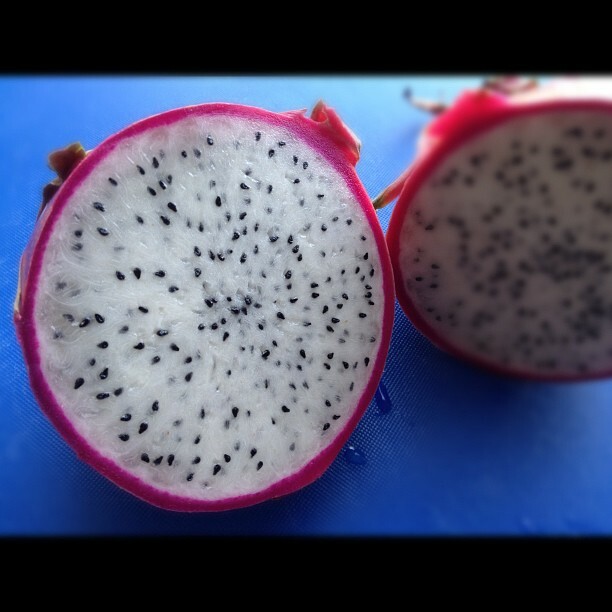 Honestly, this is such a unique fruit, it’s hard to compare it to anything remotely familiar. I started with sampling a slice. The skin was easy to peel, just a simple pull – I can’t remember a fruit’s skin ever being that easy to remove. I then cut more slices. Expect it to feel like a peeled tomato, mango, or kiwi – slippery – so be careful. I then sliced it pizza style for us to enjoy. The fruit has a very mild but subtly sweet flavor. 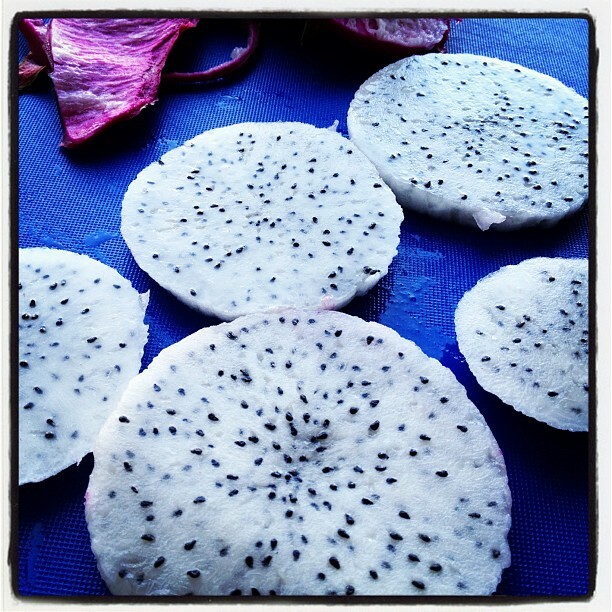 The texture is silky smooth, in the same fashion as a papaya or cantaloupe. Delicious! When trying a new fruit or veg for the first time, do you ever wonder if you’ll be allergic to it right before taking a bite? I do – hahaha. Luckily neither of us were allergic.